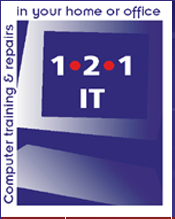 Welcome to 1·2·1 IT Computer Training & Consultancy now celebrating 14 years of assisting private and business customers with all aspects of IT. From basic word or excel training to project management, website consultancy and design to social media training or purchase and installations of equipment. We offer professional, confidential and tailored, one to one private sessions either at your home or in your office. So, the difference is, we come to you! 1·2·1 IT offers custom-made solutions for your diverse training needs, saving time, and money when you only learn what you need to know. We also offer website updating and mailshot creation as well as a complete IT service for businesses so if you are too busy and keep putting IT tasks on the long finger, let us help you out. We can focus on keeping your IT up to date and your presence felt while you focus on the business. Call Geraldine now in 086 3473473 to discuss your needs. From buying and setting up a home computer, laptop, ipad to advanced computer training, we're here to help you every step of the way! Learn the benefits of modern technology from writing a letter using e-mail to ordering your grocery shopping on-line. We provide you with the know-how and confidence for your individual requirements . Click here to read about our specialist services to private individuals. We provide individual, tailored training on a variety of programs, including the Microsoft Office Suite, in-house systems and operating systems to staff, with individual training for each person at their desk. We specialise in database creation and management. And can also assist you with the management of projects. Geraldine is an associate member of the Instutite of Project Management . Click here to read about our specialist services to business users. 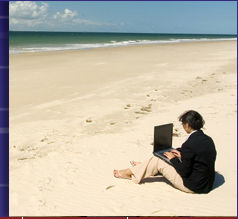 The difference with 1·2·1 IT Computer Training is that we come to you, wherever you are. From Portmarnock . . . to Navan . . . to Dalkey . . . to Kildare Town . . . to Howth . . . to Wicklow Town . . . to Castleknock . . . to Smithfield! Now that we’re in our twelfth year of business, we have a proven track record with a growing list of customers. We listen to customers first and provide them with the services that they actually want. Once you become a 1·2·1 IT customer, we are always thinking about your IT needs. Our IT consultants are committed to delivering training programmes in an enjoyable and unique style. We’re not agents for any computer brands or retailers and therefore we can genuinely offer you unbiased, expert advice when it comes to investing in technology. 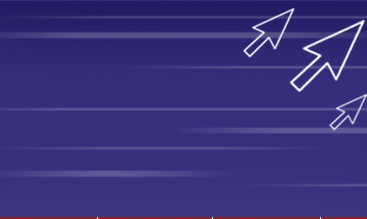 1·2·1 IT promotes continuous internal training – computers and software packages continuously evolve and therefore your training needs evolve too. Call Geraldine Walsh, Managing Director 1·2·1 IT, now on 086 3473473 to discuss your IT needs! Making contact is the first step to an unimaginable amount of information.